Lama Thubten Phuntsog Rinpoche (?-2012) was a contemporary Tibetan master, originally from the Gelug tradition, but who has was trained in the Dudjom Tersar lineage by Golok Serta Rinpoche. He practised Chö in 108 charnel grounds all over Tibet, India and the Himalayan countries, and was also regularly performed healing Chö practice for local people, and had been living in the United States between 1999-2007. He was born in the area of Mon, at Lebo near Tso Na, around 1928. His father was Tsewang Dondrup, and mother Jampel. He was the middle one of three children. He entered the monastery of Tso Na at about the age of 13, under Gon Tsa Tulku. The original lineage of the monastery was from Jigme Lingpa, but at some point all of the monasteries in the area had been converted to Gelug, including Tso Na. At about the age of 18, Lama Thubten Phuntsog Rinpoche left Tso Na monastery and went to Bhutan, where he worked for about three years. He then returned back to his monastery in Tibet, where he became a tutor, and then a custodial official (gon nyer). Then, he decided to go to Lhasa on pilgrimage, and staid about a month in Drepung and Sera monasteries, and then he stayed for several years at the Ganden Jangtse Dratsang as an unofficial secretary and disciplinary official. He received getsul ordination while in Lhasa. Lama Thubten Phuntsog Rinpoche left for India to meet H.H. the Fourteenth Dalai Lama Tenzin Gyatso who was making his first visit to India to meet Prime Minister Nehru, and to go on pilgrimage. He spent several months visiting the many holy places in Northern India, and then went over to Sikkim, and from there to Mugum Rong in Nepal. He spent several months in solitary retreat there, in the cave known as Jampalma, reciting the Mani. Lama Thubten Phuntsog Rinpoche, who was still nominally a Gelugpa, met then a travelling and already elderly Nyingma lama named Golok Serta Rinpoche, a senior student of Degyal Rinpoche (an actual direct disciple of Dudjom Lingpa). He had spontaneous faith in Golok Serta Rinpoche and received from him a complete set of empowerments and instructions on Tröma Nakmo, on ngöndro and ngo shi practices of this cycle. He then went back with Golok Serta Rinpoche to Namkha Chung Dzong where they travelled around a lot, never staying in the same place for very long. Lama Thubten Phuntsog Rinpoche went to Boudhnath to obtain guidance from Dudjom Rinpoche regarding the construction of the temple. After, Chatral Sangyé Rinpoche told him to settle in Yolmo with his wife and family, which he did. Lama Thubten had been living and practising intensively in Yolmo for some years when Khenpo Chimay Tsering asked him to come over to New York to help with his fledgling Pema Tsal dharma center. Even though he was already quite old, and had never been to the west, Lama Thubten consented to go if it would benefit beings. During his seven years in the U.S.A., Lama Thubten gathered many disciples, to whom he taught the preliminaries, Chö, and other practices. 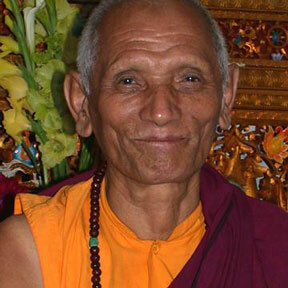 He repeatedly guided his student on the Dzogchen path, in accordance with his own realization. Out of compassion for the suffering of sentient beings, he had been a strict vegetarian for many, many years, emulating in this way Chatral Sangye Dorje. This page was last edited on 13 November 2015, at 15:39.